in front of the Swamp Water Cafe! Welcome to Billie Swamp Safari on the Big Cypress Seminole Indian Reservation. We invite you to explore 2,200 acres of untamed Florida Everglades preserved in its pristine state by the Seminole Tribe of Florida. Enjoy and experience the wonders of nature on your next family vacation. 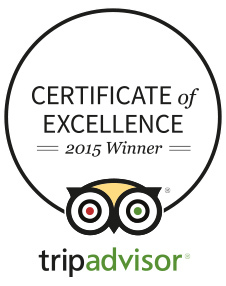 Experience our award-winning Swamp Buggy Eco-Tour as you immerse yourself into Florida’s best land attraction. Explore the “River of Grass” on our airboat ride trail and experience the wonders of the Florida Everglades like never before. Families can relax in the shade in Fort Critter and discover some of the native creatures of the Everglades in this uncaged presentation. Visitors are welcome to stroll the grounds and enjoy many of the displays and exhibits in our park, such as bird and reptile exhibits. Enjoy the wonders of the South Florida Everglades on your next family vacation at Billie Swamp Safari! Our family-friendly adventure includes four different eco-systems preserved in their pristine state by the Seminole Tribe of Florida. Furthermore, vacation families can board an airboat ride or swamp buggy eco-tour to see over 15 native and exotic species roaming freely through our wildlife park. After your Everglades adventure ride, stroll through our grounds and petting zoo attractions. Next, walk along the water’s edge and immerse yourself through a secluded pop ash swamp where American alligators take refuge. Additionally, there is magnificent flora and fauna to be seen all around. Moreover, your authentic Florida Everglades adventure is only 60-minutes from the greater Fort Lauderdale area! 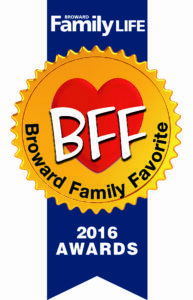 We are your best Florida family adventure and natural attraction destination for children and adults of all ages. 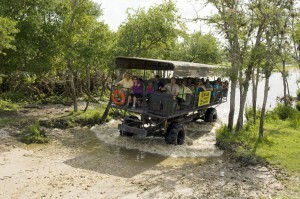 Come aboard one of our sleek airboats and voyage onto the river of grass for an amazing Everglades airboat ride! 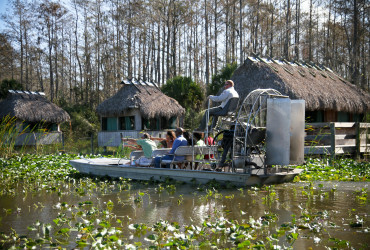 As such, our airboat guides will take you on a journey of a lifetime to some of Florida’s most unique creatures. In addition, Billie Swamp Safari airboats are safe, comfortable and agile water crafts that will keep you close to the action of the Everglades marsh. 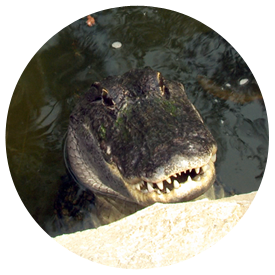 For example, you will most definitely run into alligators along the way, who may even smile for a photo. At the same time, you will witness the Florida Everglades most unusual and exotic wildlife. Finally, our Everglades airboat rides are 25-minutes long, offering ample time to see some of the wetlands most extraordinary animals in their natural environment. 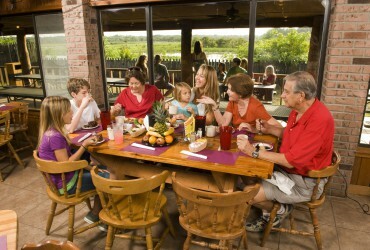 Our safari park packs all the beauty and wonder of the Florida Everglades into one family fun experience. 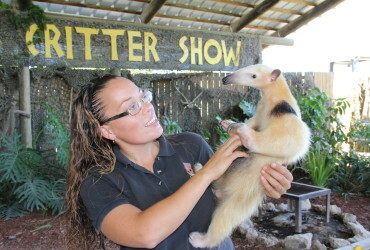 Through exciting shows, tours and exhibits, Billie Swamp Safari is home to thousands of plant and animal life species. In fact, we set out to showcase them all for everyone to see. 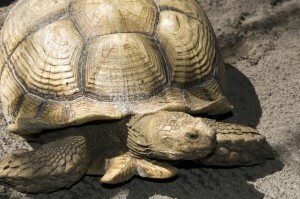 For example, our Animal exhibits feature birds and reptiles, and even rare species. 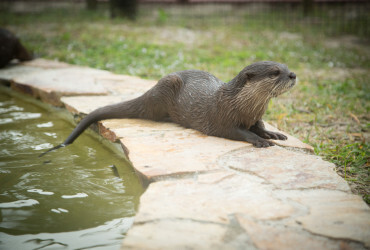 In addition, the Everglades Live Critter Show offers visitors a personal interaction with deer, baby goats, groundhogs and more. 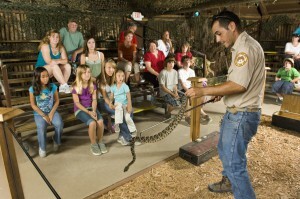 However, older kids might gravitate to our Snake Show of both venomous and non-venomous snakes. Lastly, the Seminole experience would not be complete without a stroll through an actual Seminole village and our quarter-mile boardwalk.